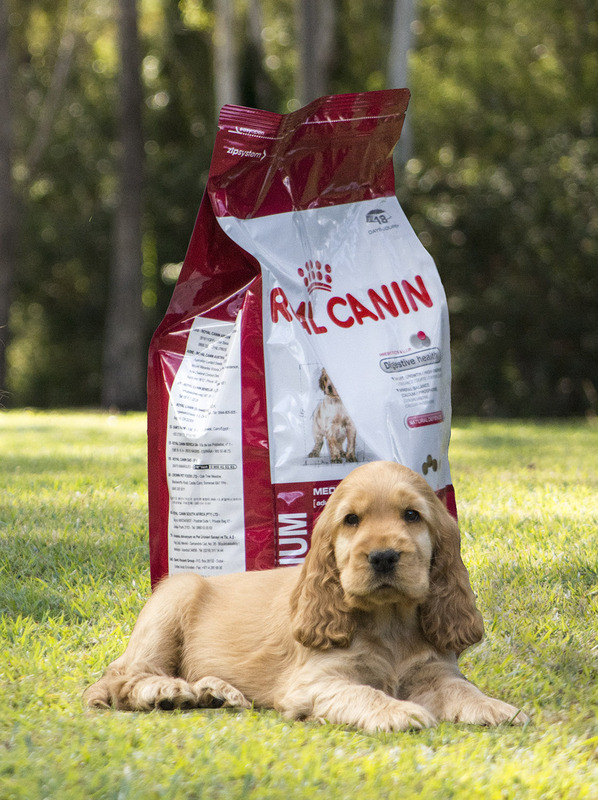 All Ravensnite puppies are raised on Royal Canin Medium Junior. All puppies go to their new owners with their own bag of food. Whilst you do not need to stick with Royal Canin for the dog's whole life, I do strongly recommend that you ensure that you stick with a premium food. If you are going to change your dog's diet, please do so gradually as a big change can upset their tummies and you may end up with vomiting and diarrhea. It is important that you do not leave food out for your dog to graze on 24/7. Puppies under 12 months old should be fed where possible three times a day (twice a day at a minimum) and on each occasion, put the bowl down and what the dog hasn't eaten in 10 minutes, goes back away. You may experience periods where your dog does not eat, but it is very unusual for a dog to starve themselves. Usually after two days, they will be back eating like nothing had changed. By having a dog that only eats at given meal times, not only does it help control the weight on your dog, it also helps you to recognise when a dog is unwell. Often one of the first things vets will ask if you think your dog is sick, is when it last ate and how much it ate. You cannot answer this if the dog has access to food the whole time. Some of my pet families do feed their dogs raw or a mix or raw and kibble. This is totally up to you. As kibble should be a completely balanced food source, if you are going to switch to raw, I would strongly recommend that you are well informed as to what your dog needs in his diet. Too much fat, too much protein and too much calcium can all cause problems in dogs. For this reason, I do strongly recommend that you keep your puppy on a puppy specific kibble until they are old enough and developed enough to move to adult food. Cockers LOVE food! It's as simple as that. If it was up to your dog, they'd be so fat they wouldn't be able to move - which they'd consider to be fine, as long as there was more food there. This is not good for your dog and especially dangerous for a young puppy. Puppies who are overweight in their early growing stages are at far higher risk of developing hip dysplasia and other health problems. The measurement guides on the food bags are reference guides only and for most dogs, are too much. The best way to manage your dogs weight is by feeling them and looking at them. You should be able to see a tuck in after their ribs between their ribs and their hips. As Cockers do have quite a lot of hair (especially as growing puppies) some times the best time to check this is when they're having a bath as then the coat is flattened. The other way to check is to feel their ribs. You should be able to feel their ribs with a little bit of coating over the top. If you cannot feel your dog's ribs easily, there is a good chance that they are overweight and in that case, you will need to reduce their food intake. Be mindful of what you're feeding your dog. You may only be feeding a cup of food, but if the dog isn't be exercised much or it gets plenty of treats, a cup of food may be too much food. Puppies will eat quite a large amount of food as they grow but most adults will eat less than they did as puppies.